Do Guinea Pigs Have Eyelids? If your guinea pig always looks bright-eyed and wide awake, it is for good reason. He may not always be wide awake, but his eyes are almost always open. Guinea pigs do have eyelids, but they do not use them in quite the same way as humans. Instead of closing their eyes when they sleep, guinea pigs leave their eyes open. 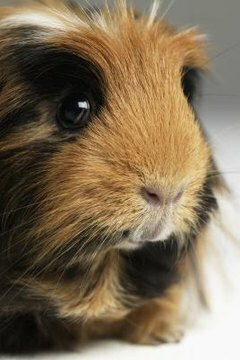 This may make it appear as though guinea pigs do not have eyelids, since their eyes are almost always open. Guinea pigs do blink as necessary, and use their eyelids to keep out dust and dirt. A guinea pig's eyelids can become infected if they become irritated by dirty or sharp pieces of bedding. In cases of infection, the eyelid will become swollen and highly visible. If your guinea pig's eyelid looks red, swollen or irritated, contact your veterinarian.